If you would like to contribute to this page, please Contact Us! We'd love to hear from you! Robin is my second Jack Russell Terrier and Agility dog, but my first deaf dog. She was born April 27, 1997 and came to me from her breeder, a friend, at age 14 weeks. Pick of the carefully bred litter, her breeders were devastated to learn she was deaf at five weeks of age. They wanted a home for her with an older, male terrier. My Wishbone fit their order for a big brother, and we were thrilled to have Robin in our home. I grew up with a blind Cocker Spaniel, so my first thoughts were that a deaf dog would be a challenge, but it never entered my mind that she would be abnormal in any way. It never occurred to me that she couldn't do all the fun things her big brother did, like JRT racing, go-to-ground, and that fun thing we recently discovered at a terrier fun day - Agility. After getting to know my new puppy and starting her housebreaking and basic training, my original thoughts were reinforced. This dog was extremely coordinated for her age and very athletic. She already had little trouble matching her brother's incredible speed, turned on a dime, and could jump on the bed or couch with one simple hop, even at 5 pounds. 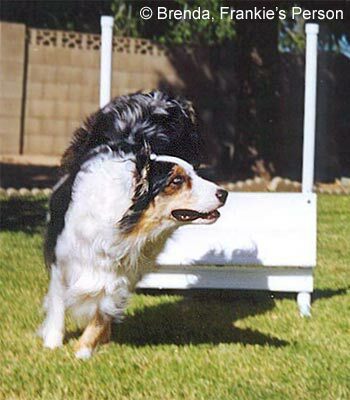 Most of the following information on Agility is not specific to deaf dogs. Foundation training, handling skills and methods apply to all. 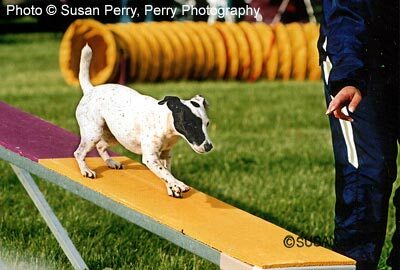 Signal training can help a hearing dog better execute the Agility course. I encourage new students of the sport to do as much background reading as possible in books, websites and magazines. Even if you are not sure that you will ever enter an Agility test, any learning you do will help you train your dog. ... see Heather's complete recommendations at Heather & Robin's Tips. Fair Warning! The following is based on a non-competitive perspective. We enjoy Agility with our dogs, however, at the present time, we are not competing. What works for us might not be in the best interest of competitively-inclined folks. If you are entertaining thoughts of competitive Agility, we suggest working with a competitive Agility trainer. Depending on the activity (and the dog!) your dog may watch your hands more than your facial expressions. Keeping that in mind, it's a good idea to make sure your hands are held in proximity to your face/shoulder area, to ensure a good chance at the dog's seeing them. Consider using one-handed signs (since you may be holding a leash or tab with one hand, during training sessions). If you use a lure (a toy or a food treat) while training, try to remember to keep the lure right behind the hand you are signing with. This helps the dog look in the right place (your signing hand). When introducing new obstacles to your dog, first concentrate on getting the dog over/through the obstacle in a positive manner. Don't worry about what hand signals to use at this point - that will come later. Agility should be about fun and confidence building. Remember to use the dog's "good" and "very good" hand signals frequently to reinforce the desired behavior. Keep a happy expression on your face, relax, and have fun! We've found that body language plays a larger factor in running the Agility course than making sure we sign each piece of equipment. Use your shoulders, the angle of your head and, of course, your hands to direct the dog. Both hands, side of hands facing dog, make a tent with hands, or ASL for the letter "A"
One hand, index and middle finger up, rest of fingers curled down, hold fingers at eye level, make a circular motion or, ASL for the letter "C"
One hand, index and middle finger pointing down with motion (like your fingers do the walking through the Yellow Pages), or ASL for "walk" or ASL for the letter "W"
One hand flat, at chin level, palm facing dog, make an arc motion (like you're wiping a window) or ASL for "jump," or ASL for the letter "J"
Broad Jump: One hand flat, at chin level, palm down facing the ground, make an arc motion (like the top of a large circle), or ASL for "over"
Tire Jump: One hand, index finger to nose, sweep hand upward, or ASL for the letter "O"
One hand flat, palm down, side of your hand to dog, move hand up/down (like an undulating wave), or ASL for the letter "T"
Hand, palm down (facing the ground), thumb towards your chest, move your hand downward, as in pushing down bread dough, or ASL for "push"
One hand, closed fist, facing down, move in one circular motion at chest level, or ASL for "circle"
One hand, back of hand towards dog, palm facing your chest, make a back and forth motion (like sweeping crumbs off a table), or ASL for "weave"
Introduction to Agility - from the The Dachshund Club of America, Inc.